Purchase a random year $20 Liberty Eagle VF Gold Coin online at the lowest price guaranteed! With the California Gold rush of 1848 and a new chief engraver to the United States, James B. Longcacre, came a newly designed liberty double eagle. This coin is highly sought after for both its high gold content and its antique value. The obverse of this gold round features Longcacre's rendition of Lady Liberty, as her left facing bust is surrounded by thirteen stars, representative of the thirteen original American colonies. The year of issue rests below the bust. The reverse illustrates the national emblem of the United States of America, a bald eagle with outspread wings, an olive branch in its left talon and an olive branch in its right. A crested badge rests at its center, and the official motto of the United States “In God we Trust” above the eagles head. With a high VF rating, buyers can rest assured about the quality of their investment. Sichern Sie sich Ihre noch heute! Rückseite Wappenadler mit Pfeilen und einem Olivenzweig in den Krallen sowie die Worte "United States of America Twenty Dollars. In God We Trust". Wappenadler mit Pfeilen und einem Olivenzweig in den Krallen sowie die Worte "United States of America Twenty Dollars. In God We Trust". 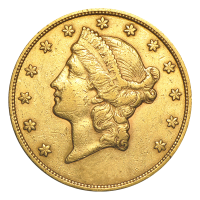 $20 Goldmünze - Freiheitsdame Doppeladler VF (sehr schön) - Zufallsjahr Purchase a random year $20 Liberty Eagle VF Gold Coin online at the lowest price guaranteed! With the California Gold rush of 1848 and a new chief engraver to the United States, James B. Longcacre, came a newly designed liberty double eagle. This coin is highly sought after for both its high gold content and its antique value. The obverse of this gold round features Longcacre's rendition of Lady Liberty, as her left facing bust is surrounded by thirteen stars, representative of the thirteen original American colonies. The year of issue rests below the bust. The reverse illustrates the national emblem of the United States of America, a bald eagle with outspread wings, an olive branch in its left talon and an olive branch in its right. A crested badge rests at its center, and the official motto of the United States “In God we Trust” above the eagles head. With a high VF rating, buyers can rest assured about the quality of their investment. Sichern Sie sich Ihre noch heute!